Brandon Essig is a veteran of high-profile jury trials. A seasoned courtroom lawyer, Brandon has tried dozens of high-profile jury cases in his career. His courtroom experience includes both civil and criminal jury trials in state and federal courts, and multiple appellate arguments. Representing individuals, corporations, businesses, colleges and universities, Brandon guides his clients through complex litigation in federal and state court, federal and state grand jury investigations, state ethics matters, regulatory investigations, and Title IX and NCAA infractions matters. 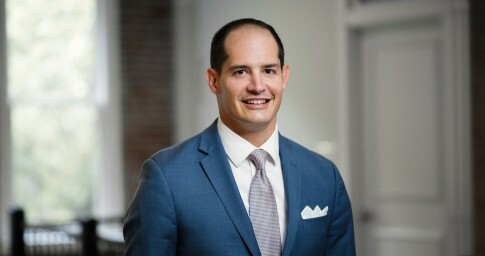 Despite Brandon’s experience and success as a litigator, he believes the best service he can provide to his clients is advice and counsel that helps them avoid legal pitfalls. Brandon learned the value of robust and effective compliance while in-house at a Fortune 500 defense contractor where he worked with a team that developed a multifaceted program that addressed various enterprise risks such as FCPA (foreign bribery), ITAR (arms trafficking regulations) and the False Claims Act. As a result, he seeks to assist individual and corporate clients with complex compliance issues through the conduct of effective investigations, as well as the development and implementation of proactive compliance programs. Before joining Lightfoot, Brandon spent more than a decade in public service. He worked for nearly eight years at the Department of Justice. As an assistant U.S. attorney, he investigated and prosecuted a variety of crimes including public corruption, fraud, money laundering, violent crime, organized drug trafficking, environmental crimes and child exploitation. Brandon was a captain in the U.S. Marine Corps prior to his work for the DOJ. His service included time as a prosecutor and 10 months assigned to a Marine Corps infantry unit, including a seven-month deployment to Fallujah, Iraq. A former college athlete, Brandon played football at the University of West Alabama where he was twice selected as an Academic All-Conference tight end. Brandon’s public service took him all over the world, and he thrived in challenging and complex legal environments. Brandon’s service in Fallujah, Iraq, as a Marine included dozens of foot patrols; interactions with local tribal, political and military leaders; and the conduct of investigations in one of the most challenging environments on the planet. While serving as federal prosecutor, Brandon led his office’s investigation of an international rhino poaching crime syndicate, which resulted in guilty pleas of two professional hunters from South Africa and the indictments of two South African nationals. That investigation was conducted in concert with DOJ’s Environmental Crimes Section. As part of that investigation, Brandon traveled to South Africa and worked closely with DOJ’s Office of International Affairs and the U.S. State Department to bring about the indictments in that case. Brandon’s time outside of compensated work is devoted to helping his wife Ashleigh, a full-time kindergarten teacher, control the unbound energy of their two sons and daughter. When time permits, he also likes to read, workout and spend time in the woods. Brandon and his family are members of the Cathedral Church of the Advent. Representing a partner at a major law firm in a four-week federal public corruption trial. Representing an SEC head football coach at an NCAA Committee on Infractions hearing. Representing a physician in a seven-week federal criminal RICO trial. Representing a corporate executive in a multidistrict investigation by the Department of Justice. Conducting a multiweek investigation of alleged Title IX violations at a major NCAA institution. Conducting a months-long investigation related to alleged NCAA infractions and criminal violations at a major NCAA institution.